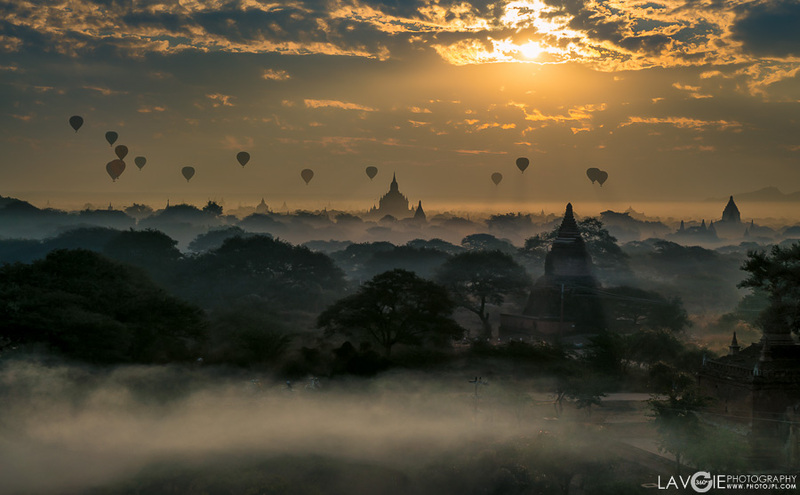 Balloons over Bagan at sunrise in Myanmar. Photography by Jean-Pierre Lavoie. All rights reserved. Click here for the interactive virtual tour. We were fortunate to fly in a group of balloons one morning last January over the ancient temples of Bagan in Myanmar. This was a fantastic experience from the company Eastern Safaris. We show you here the amazing scene of balloons taking off in the distance over this amazing historic site in Bagan just at sunrise. More than 10,000 Buddhist temples were built between the 11th and 13th centuries and there are around 2200 temples and pagodas still on site today. The temple in the distance near the balloons is the impressive Ananda temple. One other panorama shows the Thatbyinnyu temple unders the stars in a night scene surrounded by many other temples. We were located on the top of Shwegugyi Temple to capture the scene with this interactive virtual tour with Thatbyinnyu temple under the stars and Shwegugyi Temple.